I would like to submit this picture of my German Shepherds for your photo contest. And you must be a big fan of Graeco-Roman Gods - the dogs names are great and definitely not ones you hear every day. Big strong names for big strong dogs! I appreciate you sending in the picture and I hope you'll continue to send in more of your German Shepherd trio. They are all absolutely beautiful (or handsome as the case may be). Continued success with all of them! So funny. 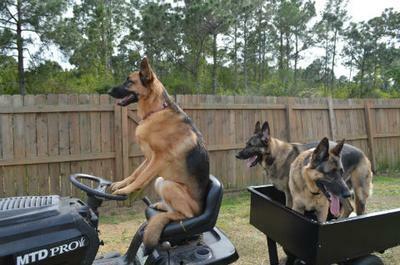 German Shepherds are so smart and they love to have a job. You have beautiful dogs. We have a white female German Shepherd and she likes to bring us the newspaper each morning. Oh my goodness look at those Amazing Shepherds - Beautiful and they can drive too! You have triple Protection, Protection and Protecton. Looks like never a dull moment at your home. Take care of your Shepherds and they will take care of you!